February can be a pretty drab, dismal month, but there is one thing I always look forward to this time of year – maple sugaring season! It’s still a bit early for the real sugaring season, but my cravings for maple-flavored treats are already going into overdrive. Last year I made a batch of Maple Sugar Snow Candy and this year to satisfy my maple cravings, I decided to make a maple cream filling for some dark chocolate maple homemade truffles. 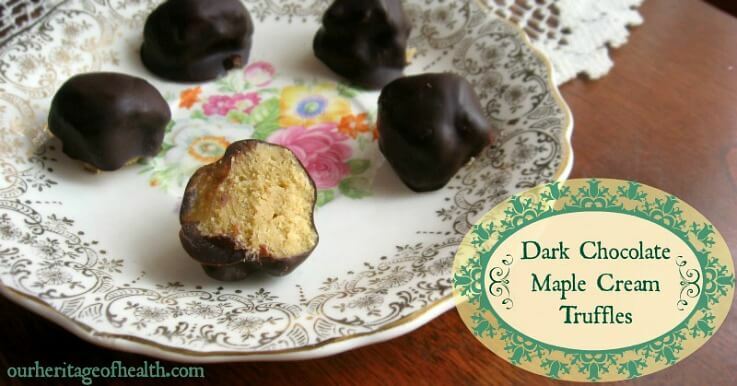 While you could try making the filling for these homemade truffles with maple syrup, using maple sugar will give the best maple flavor and the best texture. It would be pretty hard to find the right balance between having enough maple flavor and having a sticky, runny mess using the syrup. Another bonus of using maple sugar is that you don’t have to use any refined, processed confectioner’s sugar to make these truffles. Maple sugar isn’t as popular as maple syrup, so it isn’t quite as easy to find. If you live near a place where maple syrup is made, the best and cheapest place to find maple sugar is at a local sugar house. If you don’t live near a maple sugaring area, though, you might be able to find maple sugar at a specialty foods store (I know I’ve seen maple sugar at Whole Foods before.) If you can’t find maple sugar near where you live, though, you can find it online. (Find organic maple sugar here). 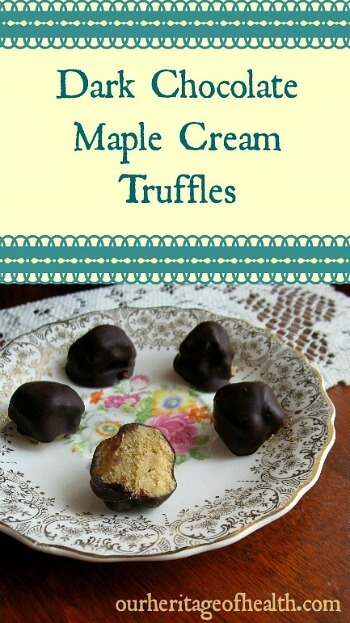 The cream filling in these truffles uses powdered maple sugar. Unless you are really lucky, though, you’ll probably only be able to find granulated maple sugar. I’ve never seen it sold in powdered form before. The granules are a bit softer than cane sugar, though, so it’s not too hard to powder them yourself. * The purpose of the arrowroot powder is just to thicken the maple cream mixture up a bit to make it easier to work with. If you don’t have arrowroot powder, you could chill the maple cream for 15-20 minutes instead before dipping it in the melted chocolate. ** 1.5 ounces is about half of a standard chocolate bar. For the best quality, I would recommend chocolate that is organic, soy-free, and gmo-free. (You can find one of my favorite kinds of dark chocolate here) I would highly recommend dark chocolate – the darker the better. I used an 85% bar. Since the maple cream is so sweet, the slight bitterness of the dark chocolate helps to balance out the sweetness. While butter is softening, process your granulated maple sugar into powdered maple sugar, using whatever method you prefer. Cream together the butter and powdered maple sugar just as you would do if you were making cookies. Mix in the pinch of salt and the arrowroot powder if you choose to use those. If your mixture feels a bit too soft, pop it in the fridge to chill for a few minutes while you melt the chocolate. Dip each maple ball into the melted chocolate, rolling it around a bit to make sure it’s fully covered, and place on a tray or plate. Pop the truffles back into the fridge to let the chocolate harden. Lick the remains of the melted chocolate and maple cream out of the bowl while you wait and then enjoy the maple-chocolate decadence! Note: This recipe makes 8 small truffles. You could easily double or even triple the recipe if you want to make more or if you want to make larger truffles. Because the maple cream filling is so rich and sweet, though, I’ve found that a small truffle is satisfying enough. This post is linked to: Sunday School at Butter Believer, Natural Living Monday at Natural Living Mamma, Clever Chicks Blog Hop at The Chicken Chick, Family Table Tuesday at The Polivka Family, Party Wave Wednesday at Holistic Squid, Natural Living Link-Up at Jill’s Home Remedies, Fight Back Friday at Food Renegade, Weekend Gourmet at Hartke is Online. These look amazing! I have 2 maple lovers in my life so I must make these. I haven’t tried maple sugar yet. These look awesome! I can’t wait to make them!